60 non-profit organizations will receive the funds through the organization. The 12 News newsroom got a special visitor from Fiesta Bowl mascot, Spirit! He stopped by to announce Fiesta Bowl Charities $2.5 Million in charitable giving for the 2018-19 season. The total over the last eight seasons jumps to $12.5 million for Arizona nonprofit organizations. 60 non-profit organizations will receive the funds through the Fiesta Bowl Charities. It's all made possible through its two annual bowl games in the Valley, The PlayStation Fiesta Bowl and the Cactus Bowl, as well as other community events. The group is jazzed up for football season and expects big things to happen as we get closer to the Fiesta Bowl itself. The tradition lives on since 1971 and all the action happens at the University of Phoenix Stadium. The mission of Fiesta Bowl Charities is to continue the core of its efforts which focuses on youth, sports and education. - 3 playgrounds donated, impacting approximately 6,000 people. 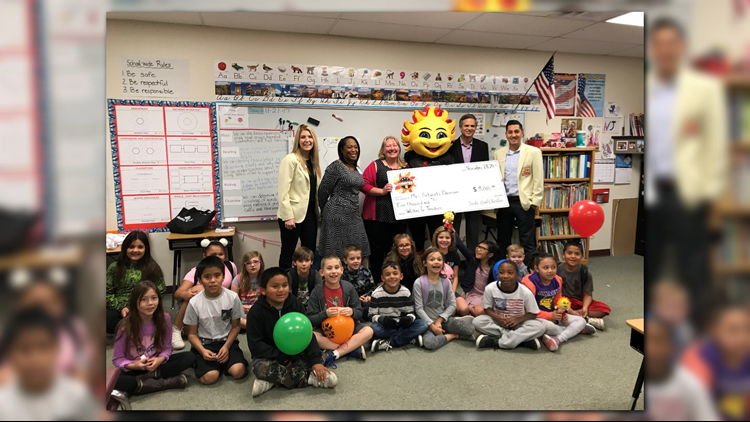 Fiesta Bowl Charities has earmarked $500,000 of the total grant money to be donated through the Fiesta Bowl Wishes for Teachers program. The organization brought goodies to the staff and hopes to make a bigger impact throughout the year to again maximize their mission to make Arizona a better place for youth, sports and education.